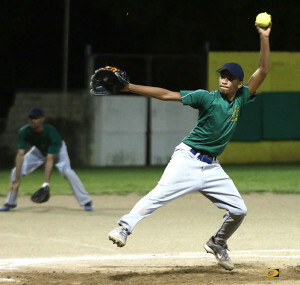 By outscoring two opponents by a combined 24-3 score, Power Outage improved to 9-1 and took took control of the Virgin Islands Baseball Softball Association Harriette Skelton League at the E. Walwyn Brewley Softball Park over the weekend. In Friday’s game, Yervis Rodriguez gave up one hit to the Mobsters’ Alfonso Tejada and their offense belted Jason “Mad” Fonseca for two homers among 13 hits, during a 14-0 blowout victory. Power Outage’ Jamarlie James went 2-for-3 with a home run, a run scored and two runs batted in. Kevin Faulkner also had a 2-for-3 game with a double, three runs scored and 3 RBI’s. Khoy “Mailman” Frett delivered a homer and a double during his 2-for-2 appearance. He scored twice and drove on three. On Sunday, Dariel Robinson scattered four hits as Power Outage defeated the A’s, 10-3. Jayque Hopkins was the losing pitcher. Tecius Frett homered and had 4 RBI’s. Kyle Callwood also homered in three at bats and finished with two runs batted in. Rodriguez went 2-for-3 with two runs scored and a run batted in. Joseph Smith Jr. of A’s finished 2-for-3 with a triple and a run scored. The Pirates rode Nickos Penn’s 2 hitter with blank the the A’s, 14-0 in the other men’s game. In Women’s play, That’s Ya Problem whipped Walk Off, 20-7, on Shaika Jeffers’ three hitter. Darier Malone took the loss. Tafara Phillips of That’s Your Problem, was the top hitter, going 3-for-4. Walk Off returned on Sunday to defeat the Lady Pirates, 16-4. Malone was the winnng pitcher and the loser was Khiayah Doward. Walk Off’s Claury Scatliffe was the top offensive player, going 2-for-2 with a triple, two runs scored and a run batted in. The Hawks defeated the West End Warriors 19-4. The winning pitcher was Riiah Durante who fired a 2-hitter and the loser was Kimesha Adams. Judith Harrigan of the Hawks, went 2-for-2 with a run scored and two runs batted in. Gertrude Thomas scored four runs and Shanika Forbes three.